Posted on Wed, Apr 4, 2012 : 5:57 a.m.
A new piece of public art is planned for Depot Town's 149-year-old Thompson Block building. Ypsilanti High School art students have teamed up with a local Civil War re-enactment group to produce a 6-foot by 40-foot Civil War mural for the building’s west side. The building served as Union Army barracks during the Civil War. John Delcamp is part of the Civil War Reenacting Company E, 17th Michigan Infantry, which raised money for the project. He said part of that regiment mustered out of the Normal School - which is now Eastern Michigan University - during the Civil War, and the regiment was housed in the Thompson Block. 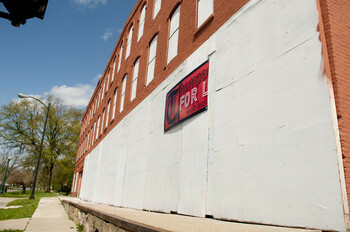 A 40-foot mural will hang on the white portion of the Thompson Block's west wall. Delcamp said buildings used during the Civil War are common in places like Tennessee and Virginia, but there are few in Michigan. During the war, the basement was used to prepare food, the ground floor was a wagon repair shop, soldiers lived on the second floor and the third floor was used for living space and dances. A collage will be created and assembled by YHS teacher Robin Evans’ students in grades nine through 12. Students will work on painting different pieces of wood that will then be assembled to create a larger collage. The students are working off old Civil War pictures and re-enactment photos provided by Delcamp. For example, some students could paint a 2-foot by 4-foot portrait of a Civil War colonel, while others could work on a longer picture of the wagon repair shop. The two pictures will then be pieced together on the River Street side of the Thompson Block. Evans said she is hoping to have the collage complete by the time students leave for summer break in June. The mural will be up at least through the Heritage Festival, which is planned for mid-August. Evans’ past art classes have done several public art projects, and she says students were excited to get started on this effort. “They love doing it,” she said. The E 17th Michigan Infantry has also been working for seven years to have a State of Michigan historical marker placed outside the Thompson block, and Delcamp is optimistic that will happen this summer. The marker would tell the history of the building, and Delcamp said it and the mural will give the Thompson Block’s history the recognition it deserves. A fire gutted the Thompson Block on January 23, 2009. Developer Stewart Beal and the city ended up in court over a disagreement on how to proceed with the building’s renovation. The building is now painted and partly sealed, and Beal has another 18 months to complete the building's "envelope," including finishing the roof. The southeast portion of the structure also remains partially collapsed. Beal is looking for investors, financiers, potential tenants or other parties who can assist with funding the remaining construction. The project was once planned as a mixed commercial/residential use, but Beal has adjusted the plans to only include residential lofts. But, in the meantime, Delcamp is pleased with the building's new appearance. Wed, Apr 4, 2012 : 5:51 p.m. I hope the mural look nice. One of the things I was going to do with my MegaMillions lottery winnings was to buy the Thompson Block from Beal, raze it, and build a small park with some benches and flowers. Unfortunately, I didn't win, so we'll have to go with this. Wed, Apr 4, 2012 : 5:02 p.m. I guess no one has noticed, but the front of this building has been a blank white slate for months and hasn't had any graffiti appear. But oh yeah, I'm sure once someone paints a mural up there, vandal will start flocking to one of the most visible intersections in the entire town to paint over the work of kids. Because we have such a bad graffiti problem to begin with. That mural the roller derby girls painted on their building in a parking lot of Huron and Michigan has been vandalized how many times in the last year? Oh, that's right, it hasn't. Give me a break, folks. And um, isn't it that town to the west of Ypsi having all the graffiti problems? Wed, Apr 4, 2012 : 7:26 p.m.
Go take a closer look. That wall gets tagged all the time. A Beal employee paints over the graffiti each time so the city doesn't fine him. Wed, Apr 4, 2012 : 5:17 p.m. I suggest that when the painting is complete, it shold be covered in mineral oil regularly or covered with plexiglass covered in minderal oil becuase that will be the target of all targets for vandals. Wed, Apr 4, 2012 : 4:28 p.m. So happy that students in Ypsilanti will have this point of pride! Such a nice way to make a temporary positive out of something that has been nothing but negative for so long. I look forward to seeing their efforts! Also, I think the high viability of the mural may help save it from too much graffiti :c) I know HESNA, other community groups, and local business are aware and planning to keep an eye on it. Wed, Apr 4, 2012 : 3 p.m. Wed, Apr 4, 2012 : 2:38 p.m. The mural will be VERY cool; all Michigan Regiments, including the 17th, played significant roles during the Civil War. They should definitely be honored in all ways possible, and this mural will be such a fitting tribute. I can't wait to see it. I also hope that the historic building marker becomes reality. I love the idea and can't wait to see the finished product. I just wish it could stay there indefinitely. Maybe something can be done to keep it from being damaged? Now, what about the building itself? I have not heard a thing since the owners finally are getting it together. I remember my mother talking about way back when, they did indeed have dances on the third floor. There was more room there. Although the sleeping quarters on the second? And food in the basement? Sounds interesting. Wed, Apr 4, 2012 : 11:34 a.m. There needs to be an armed guard to watch this 24/7 or it will turn into a graffiti wall. Wed, Apr 4, 2012 : 12:31 p.m. Wed, Apr 4, 2012 : 12:20 p.m. Sorry tdw (bub) but this wall will succumb to the graffiti society, I guarantee you !! Wed, Apr 4, 2012 : 12:01 p.m. Wed, Apr 4, 2012 : 11:12 a.m. Forget the mural. Let's see some of this supposed renovation progress that Beal was supposed to be making after holding Cross and River streets hostage with those buttresses for 2 years. Wed, Apr 4, 2012 : 2:59 p.m.